When I was an Indian-American girl growing up in Boston, my primary school teacher interrupted our lesson one day to ask me a question. What the question was escaped me. I was a habitual daydreamer and had only heard my name at the tail of a long, upward-inflected statement. I tore my eyes away from the window where snow wisps drifted from leaden grey skies, with an expression I hoped indicated I had been paying careful attention. “Yes,” I said, decisively. “Or no, sometimes,” I added, to hedge my bets. Today I’d have responded that she was illogical and Eurocentric, that just because Westerners had a celebration didn’t mean everyone did, that she was mistaking causation and correlation, and other barbed, cutting remarks which would leave her feeling small. Unfortunately, living in Nigeria and learning to harness bottomless wells of aggression was far in my future. Lagos does funny things to people. Now I could get into a fight with a plate of Jollof rice. Then, however, I was just a humiliated little girl. I rushed home from school, ashamed, and wept in my mother’s arms. “Just tell her Diwali,” my mother said. “Diwali was in November,” I said. We drank our hot chocolates and I felt better. I returned to school the next day and told my teacher Diwali was our December holiday. This was the first time I realised adults could be just as wrong as children. My own kids learned this lesson earlier because I am their mother. When my children were young, our family lived in New Jersey for several years before moving to Nigeria. 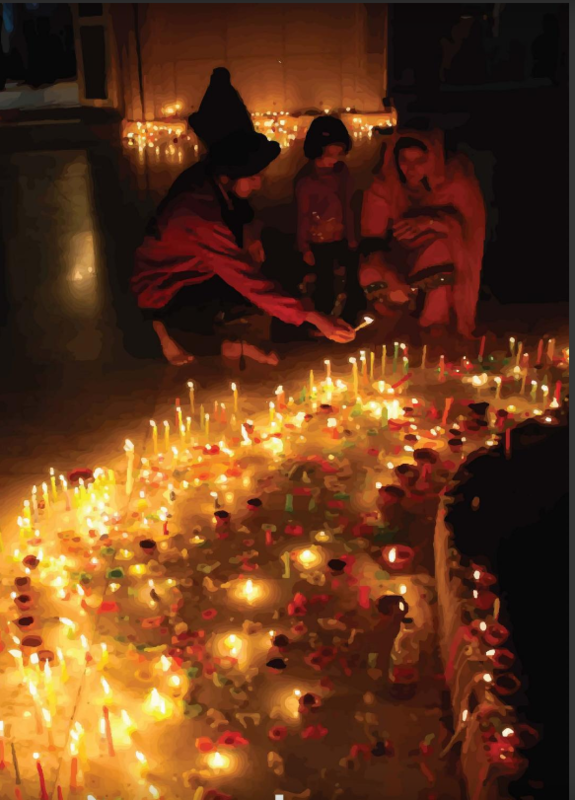 Each year near Diwali, my presence was requested in their classrooms. I wore a sari and spoke wisely about Indian traditions. “This festival represents the symbolic victory of light over darkness,” I would begin. I would describe Lakshmi, the goddess of wealth, and recount Rama’s defeat of the demon king, Ravana from the Hindu epic, Ramayana. Everyone thanked me profusely after my Diwali lectures. What no one knew was that I had no idea what I was talking about. Before entering the school, I would cram for 30 minutes in the parking lot from a children’s book about Diwali. I was faking my deep and extensive knowledge. In those days, I was an exhausted, overworked stay-at-home mom. I couldn’t keep my children’s names straight let alone remember Hindu myths. It wasn’t my fault. My brain was full. Life is a series of blunders and bluffs. Grownups are just wrinkled children imitating adults. We too may be misguided and confused. We may fake our way through life, like ill-informed women disguised as educators, or ignorant mothers feigning knowledge of cultural practices. Whatever your December holiday—or non-holiday—try to enjoy yourself. Spend time with loved ones and have compassion for those around you. As you enter 2019, save some compassion for yourself. Even if you’ve fallen short of your childhood ambitions, keep on pretending. It’s likely no one will ever know the difference.